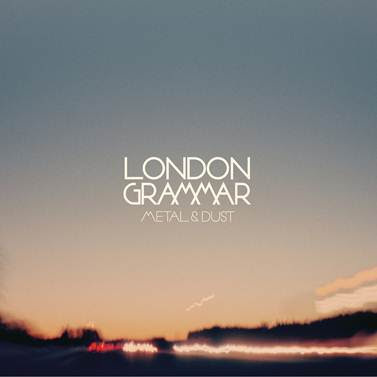 London Grammar will release their debut EP 'Metal & Dust' on February 25 through their own imprint label, which takes the same names as the EP. London Grammar consist of Hannah Reid, Dot Major and Dan Rothman who formed the band while they were at university together. After being holed up in the studio for most of 2012 working on their debut album, the band dropped their first offering ‘Hey Now’ on their Soundcloud in December receiving over 260,000 plays to date. The song garnered up a huge word of mouth buzz online and strong support at radio with plays from the likes of Zane Lowe (Next Hype), Phil Taggart & Alice Levin (ROTW), Huw Stephens, Rob Da Bank, Giles Peterson and Annie Mac to name a few. The forthcoming EP, features four tracks ‘Metal & Dust’, Hey Now’, ‘Darling Are You Gonna Leave Me’ and ‘Hey Now’ (Dot Major remix) and is the first official release from the London trio. The EP is a collection of powerful, epic tracks that draw you in instantly with their emotive, unique and cinematic sound. ‘Metal & Dust’ received its first play last night on Radio 1 as Zane Lowe’s ‘Hottest Record’. London Grammar will be performing a sold out headline London show at Electrowerkz on March 27.